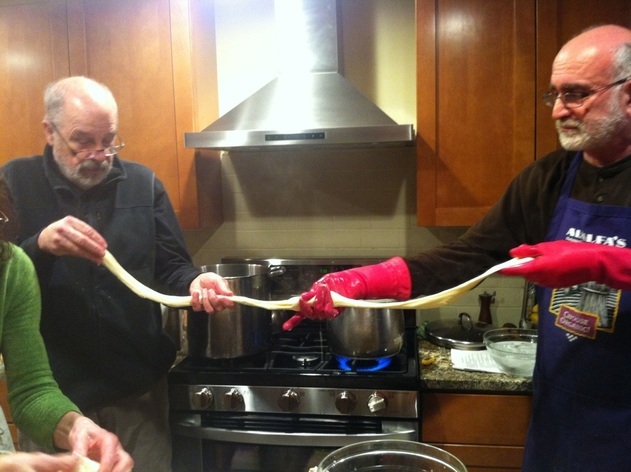 Join cheesemaker Mark Solomon for comprehensive hands-on classes for soft cheeses. French bloomy rinds, and semi-firm and hard cheeses. Offering classes throughout the Rogue Valley- in Grants Pass, Medford, Jacksonville, and Ashland as well as at our farm in the Applegate Valley. Mark Solomon is an experienced cheese maker who has taught over 1000 students the art and science of cheese making. In the last several years he has successfully made over five hundred hard cheese wheels of over twenty varieties, including Cheddar, Gouda, Sage Derby, Leicester, Colby, Leiden, Havarti, Parmesan and Monterey Jack as well as many soft cheeses and bloomy rind cheeses. He has taught in-depth cheese making classes at Pantry at Delancey, Cook's World, Dish It Up, and Cellar Homebrew in Seattle,Wa. and at Bella Kitchen Essentials in Gig Harbor Wa. as well as at Bellingham Wa. Food Coop. In October 2009 he completed an intensive Cheesemaking Technology Short Course at the University of Wisconsin in Madison, part of the Wisconsin Master Cheesemaker Program. During the spring of 2017 he took intensive training in French bloomy rind cheeses at Enilbio Dairy Technology School in Poligny, France. Time to stretch the mozzarella! March 6, 2019, Wednesday at Rogue Community College cafeteria kitchen. 3345 Redwood Highway. Grants Pass Oregon from 5:30-8:30 pm. French Bloomy Rind Cheeses. Hands on. Do you love the taste of a Brie or Camembert cheese? How about French pyramid cheeses? You can make these cheeses in your own kitchen with a minimum of equipment. In the class we'll go into the basic steps in bloomy rind cheese making in some detail. We'll taste bloomy rind cheeses made with a lactic curd and a rennet set and learn the distinctions between them. We'll also trace the steps involved in making a particular bloomy rind cheese with a demonstration of how the cheese should look, feel, and taste at every point in the process. We'll learn variations in the process and eat some delicious homemade soft ripened cheeses. Class limited to 12 students. $75. November 11, 2018. 10 am-3 pm. Private class at our Applegate home. An introduction to making soft cheeses, bloomy rinds, and hard cheeses. We will make some of each kind. There are only 2-3 spots available in this class. $75. Please email me at solomon_arts@yahoo.com to find out more. GIFT CERTIFICATES AND PRIVATE CLASSES ARE AVAILABLE. For more information on private classes see Private Classes page.